At the start of any New Year there is so much pressure on us to make sweeping changes, lose weight, eat more healthily, do more exercise. Whilst all this is great and having goals is a great thing to motivate us, if you are busy Mum so much pressure and big targets to achieve can actually have the opposite effect and demotivate us. I propose that actually smaller, more manageable targets are actually going to see greater gains if you are already pushed for time. Simply tune into your body’s needs to get the power to make positive, lasting changes in 2016. Changes you make affect your childrens choices later on (trust me I nearly have a teenager who makes her own choices now!). 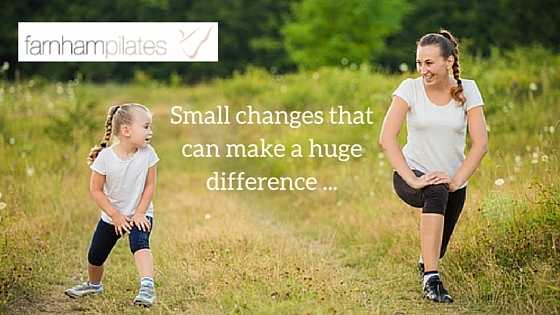 So showing that change can happen just by doing small things is a great example to set them. Here are my suggestions. 1. Take 15 mins a day to put yourself first – it’s only 1% of your day, making small daily changes and you’ll find what makes you feel good! Take a look at our 10 minute relaxation and breathing video here, which can give a you perfect time out solution. 2. Plan your meals – proper family healthy meal planning stops you snacking, plan the family meals around when you are hungry, and have relaxing nights out – say “yes” to healthy and a life! 3. Get to bed early – sleep is major (I’ve been tracking my sleep and it’s a shock!). When you are tired you reach for sugar. Get more energy from exercise or more sleep. It also lowers your risk of disease. Scientists compare those getting less than 6 hours sleep to those getting 8.5hrs and it alters genes involved in metabolism, inflammation and immunity. Also taking magnesium or eating foods like leafy dark greens, fish and avocado gives you deeper sleep. 4. Look slimmer by correcting your posture – slide your shoulders back, lift your chest up and lift through the spine, lift and engage your deep abdominal muscles to pull in your tummy. Encourage good posture in your children as well. 5. In 45 minutes you can increase your metabolism with a good work out! With regular exercise you can increase the part of your brain associated with learning and memory! Get out as a family- cycle, run or swim. They will thank you for the motivation and they look to you how to live their lives! 6. (OK I said 5 steps but I’m feeling generous!) You must do daily stretches and joint mobility to help you age gracefully – I’m training for the marathon and have to stretch to prevent back pain the next day. See my Facebook page and youtube channel for the right stretches. At Farnham Pilates we offer videos with mobility, strength, core work, stretching and relaxation! Take a look here for more inspiration or sign up to our newsletter (to the right on a PC or below on a tablet/phone) for up to date tips and news of our upcoming online programmes. « How to keep motivation high to keep your Fitness New Year Resolutions!